The exhibits in the Litchfield History Museum offer an interesting glimpse of the town's past politics, economy, industry, and art. Litchfield is one of the finest of Connecticut's historic towns. Its colorful history is recorded in diagrams, documents, furniture, historic clothing, and artifacts collected and displayed in the Litchfield History Museum at 7 South Street, just off the town green. 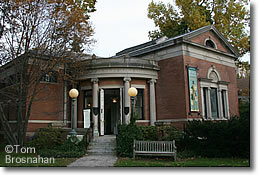 Prime of place in the museum's seven galleries are exhibits dedicated to Litchfield's most prosperous period, the 50 years following the American Revolution. just off the town green in Litchfield CT.